1917 – Following the U.S.declaration of war against the German Empire on April 6, 1917, about 90% of Alcoa’s aluminum production was directed to military applications, including mess kits, canteens and helmets. As aluminum shortages became evident during World War I, President Woodrow Wilson imposed price controls on aluminum, and the use of aluminum for military equipment and essential civilian needs was placed under government regulation. 1917 – Carl Wilhelm Soderberg of Norway filed a patent in the U.S. for a “Process of baking carbon electrodes” for use with aluminum reduction cells. The Soderberg process eliminated the need to manufacture carbon electrodes and instead utilized a single giant electrode that was replenished on a daily basis with carbon briquettes that melted and then baked in place while the cell was producing aluminum. 1917 – One of the worst race riots in U.S. history occurred in East St. Louis, Ill., on July 2, 1917, after black workers were brought in to replace striking workers at the alumina refinery operated by the Aluminum Ore Co., an Alcoa subsidiary. 1919 – R.S. Reynolds started the U.S. Foil Company in Louisville, Ky., in 1919. The company acquired The Eskimo Pie Corporation in 1924 and began using aluminum foil as a packaging material for the first time two years later. 1922 – Alcoa owned most of the process patents essential to the manufacture of aluminum engine pistons by 1922 and joined with several other manufacturers to form the Piston Patent Estate to control the patents. 1928 – Alcoa transferred ownership of 29 of its 34 foreign companies or properties to Northern Aluminium Ltd., its Canadian subsidiary, on June 4, 1928. The breakup was a proactive measure to address government concerns about an Alcoa monopoly, but Alcoa executives also were concerned about the corporate headquarters not giving foreign operations enough attention. They were also concerned about worldwide growth in protectionism and nationalism. Northern Aluminium Ltd. later became Alcan. 1929 – A U.S. court examiner issued findings in 1929 that favored Alcoa in a federal lawsuit that accused Alcoa of violating the Federal Trade Commission Act and the Clayton Act from 1925 through 1930. The findings of the examiner were affirmed by the Federal Trade Commission. 1930 –Alcoa produced and sold virtually 100% of all the aluminum electrical transmission cable in the U.S. during the 1930s. Competition still existed between copper and aluminum for transmission cable. 1930 – A deadly mist containing gaseous fluoride covered the Meuse Valley of Belgium in December 1930. The three days of industrial pollution caused at least 60 deaths. 1933 – A local aluminum union was chartered by the American Federation of Labor at Alcoa’s New Kensington plant in 1933 despite opposition by management. Within months, the AFL had formed unions at Alcoa’s plants in Arnold, Alcoa, Garwood, Logan’s Ferry, Massena, Badin and East St. Louis. 1934 – About 5,000 members of the local AFL union at New Kensington went on a 10-day wildcat strike in March 1934. Five months later, strikers closed six Alcoa plants for five weeks. 1934 – The first national organization of aluminum workers was formed in the U.S. in 1934 when several labor unions affiliated directly with the American Federation of Labor united into the National Council of Aluminum Workers. 1937 – Several local unions left the National Council of Aluminum Workers to organize the Aluminum Workers of America under the Congress of Industrial Organizations in 1937. After two years of negotiations, the new union and Alcoa signed an agreement with four plants covered in 1939 and one more in 1940. 1937 – Alcoa owned numerous hydroelectric power generating plants by 1937 totaling about 402 megawatts in developed capacity. At the time, the entire U.S. was estimated to have up to 8,206 megawatts in undeveloped capacity. 1937 – The Bonneville Power Administration was created in 1937 to handle transmission and sales of power generated by Army Corps of Engineers and Bureau of Reclamation hydroelectric dams on the Columbia River. 1937 – A selective walkout at the fabricating plant in Alcoa, Tenn., turned violent when Alcoa brought in replacement workers guarded by special police. The governor sent in National Guard troops to quell the violence. 1939 – Germany was producing more primary aluminum than the U.S. by 1939 powered by coal-fired electrical plants. 1939 – The Bonneville Power Administration signed its first industrial power-supply contract for an aluminum smelter to be built on the Columbia River at Vancouver, Wash., in December 1939. The new plant became the model for eight World War II-era aluminum smelters. 1939 – R.S. Reynolds traveled to Europe in 1939 where he was witness to the German military buildup. He returned to the U.S. and tried to get the federal government to support increasing aluminum production. He ended up mortgaging his foil plants to pay for construction of aluminum smelters in Listerhill, Ala., and Longview, Wash.
1939 – President Franklin Roosevelt asked Congress in 1939 for $300 million to build airplanes for the Army Air Corps, which had only 1,700 aircraft at the time. Congress agreed to pay for 3,251 aircraft. 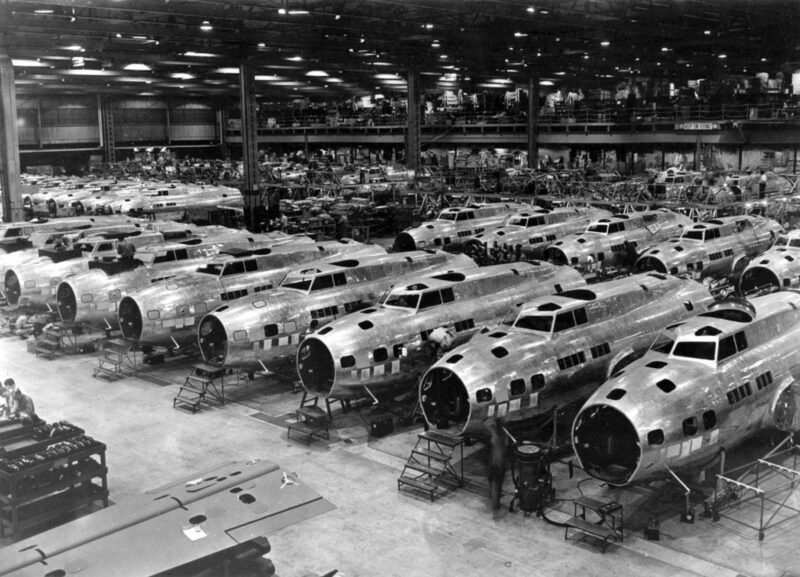 By the end of World War II, the U.S. had produced nearly 300,000 aircraft. During that time, aircraft manufacturing went from 41st place among U.S. industries to first place. Aluminum was needed to build all those planes. 1939 – Germany invaded Poland on Sept. 3, 1939, starting World War II. Allied navies blockaded important sources of raw materials for the global aluminum industry, including Greenland and South America. Twelve days before the Japanese attack on Pearl Harbor, U.S. troops arrived in Dutch Guiana to protect bauxite mines in cooperation with the exiled government of The Netherlands in London. 1941 – Alcoa was the only primary aluminum producer in the U.S. by Oct. 10, 1941, when District Judge Francis Caffey ruled against the U.S. government in an antitrust lawsuit brought against Alcoa. The monopolization charges covered bauxite, water power, alumina, primary aluminum, castings, cooking utensils, pistons, extrusions, foil, sheet, electrical cable and other aluminum products. Judge Caffey found the government’s charges to be unproven in all cases. 1941 – The federal government admitted the severity of the aluminum shortage in the U.S. by February 1941 and called for expanding production to 423,000 tons per year, with very little allowance for civilian consumption. The National Defense Advisory Committee headed by Sen. Harry Truman played a role in promoting increased aluminum production for aircraft production during the war. 1941 – During World War II, the U.S. government appropriated $2 billion to increase the generating capacity of the Columbia River hydroelectric dams by six-fold, enabling the operation of new government-owned aluminum smelters in Spokane and Tacoma, Wash., and Troutdale, Ore. One estimate was that Grand Coulee Dam alone produced the power to produce the aluminum used in making one-third of the planes built during the war. 1941 – Aluminum production in the U.S. increased from 164,000 tons per year in 1939 to a peak of 1.25 million tons in 1944. During World War II, Alcoa invested $300 million of its own money in expanding its own aluminum production facilities. The company also built $450 million worth of government-owned aluminum plants. Through the war, Alcoa managed 22 government-owned plants, including eight smelters, 10 fabricating plants, two alumina refineries and two processing plants for low-grade bauxite. 1942 – Eight Nazi saboteurs landed from U-boats on beaches in New York and Florida and were immediately captured by the FBI. An investigation revealed that their mission was to destroy Alcoa aluminum plants in Tennessee, New York and Illinois. 1944 – The 46,000 members of the Aluminum Workers of America voted to merge with the United Steelworkers. 1944 – Led by Montana Rep. Mike Mansfield, Congress authorized the Bureau of Reclamation in 1944 to build a hydroelectric dam at Hungry Horse Creek on the South Fork of the Flathead River in northwestern Montana. The dam was completed in 1953. 1944 – The war-time aluminum smelter in Riverbank, Calif., was shut down in 1944 as World War II began to wind down and farmers brought a lawsuit alleging damages to crops and livestock by fluoride emissions. 1945 – A ruling in an antitrust lawsuit originally filed in 1937 was made by the U.S. Circuit Court of Appeals in March 1945. By the end of the war, the federal government owned most of the U.S. aluminum industry, and the government wanted to sell the war plants as surplus. The court ruling paved the way for Reynolds and Kaiser to take ownership of the war plants and break the Alcoa monopoly. By 1956, Alcoa’s share of North American aluminum capacity had dropped to only 33%, leaving 27% for Alcan and 40% for Kaiser and Reynolds.